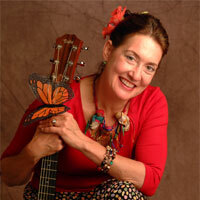 About The Artist: Katherine Dines is an award-winning children’s songwriter, recording and teaching artist who performs throughout the world. Since 1992, her Hunk-Ta-Bunk-Ta® Music has garnered numerous national awards including a Grammy nomination, while her concerts continue to captivate children and family audiences of all sizes. An advocate for literacy and early childhood education through the arts, she serves on several national boards, presents keynote addresses and educational workshops, writes and produces songs for a host of clients, and licenses her material to projects for children. In addition, she continues to expand Hunk-Ta-Bunk-Ta® Music into other product areas including books, toys and television. She is on the board of directors of the Children’s Music Web, and is the spokesperson for Music Rewards Fundraising, a company that helps schools and nonprofits generate money through selling music. Currently, she is writing and recording material for various clients and continues to expand Hunk-Ta-Bunk-Ta® into the educational and entertainment fields.